Anton Media Group recently sat down with Charles Davis, senior vice president of development for Simon Property Group, and John J. Gutleber, president and CEO of Castagna Realty Co., to talk about the proposed Syosset Park project planned by Syosset Park Development, LLC. On March 27, the Town of Oyster Bay Town Board officially accepted the project’s Draft Environmental Impact Statement (DEIS), beginning the comment period as part of the state-mandated environmental review. Residents can comment on the DEIS through Aug. 31. 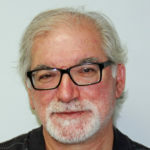 The town and the developers have also agreed to have environmental testing done at the 92.8-acre site at the corner of Miller Place (Long Island Expressway North Service Road) and Robbins Lane in Syosset. About 39 of the acres once housed the Cerro Wire industrial site, while a similar area was a town landfill for decades. Both sites were subject to toxic contamination and the state and federal environmental agencies declared that both had been remediated. But bowing to public pressure, the town has agreed to hire an outside firm to conduct what concerned citizens have labeled as an “independent testing” to determine if the neighboring areas have been affected by the contamination. The developers have agreed to pay for this further testing. Planned for the mixed-use site are 625 housing units, office and retail space, two hotels and—over the capped landfill—a park that will include playing fields and, once developed, will be given back to the town. 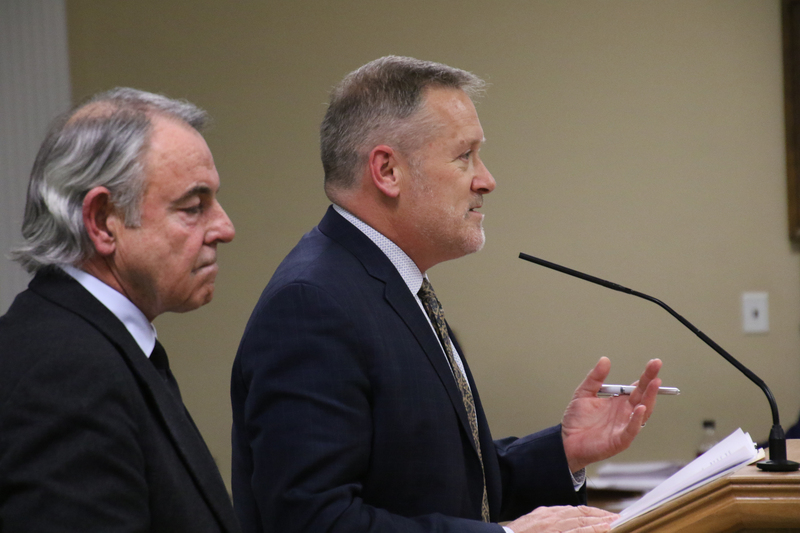 The developers, in seeking the necessary zoning changes and town approval, hope to have the proverbial “first shovel” in the ground before the end of next year. This rendering from the project’s DEIS shows a section through what the developers call the Great Park. Everything will be planned to make certain that the protective cap over the old Syosset landfill will not be pierced. On May 1, residents attended a public scoping session to watch a presentation by the developers and comment on the project’s DEIS. Held at Syosset High School, it drew more than 700 participants and the overwhelming sentiment of those who spoke was against the project. Anton Media Group asked Davis (CD) and Gutleber (JG) about their reaction to the May 1 meeting. Both men referred to the activities at the town’s Department of Public Works (DPW) site, which eventually will be transferred to the developers. They noted that, after Superstorm Sandy, the town dumped “piles and piles” of materials at the site, which sits partially over the capped landfill. 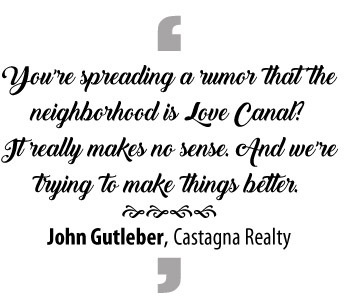 JG: “The other thing is, those people live there and they’re calling their property ‘Love Canal.’ You’re spreading a rumor that [the] neighborhood is Love Canal? It really makes no sense. And we’re trying to make things better. The conditions, if we walked away [from this project] tomorrow, is still there. If you think it’s Love Canal, you’ve got a problem. 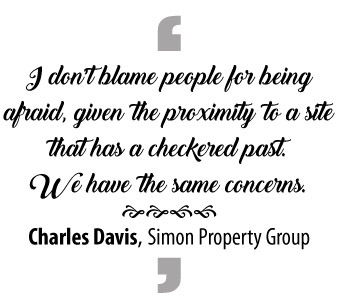 And if you keep on talking about it, you’re not going to be able to sell your house. The school district is going to go down because the value of the homes is going to go down. It’s self-defeating. Davis and Gutleber contrasted a 30-acre park as a better alternative to the town’s DPW and its attendant activities. On the proposed park itself, the trees will be “mounded” so that the roots won’t penetrate the cap. The plan is to plant tree species that don’t have invasive roots. “That’s why we hired the landscape firm we did because this is not the first time they’ve worked on environmentally challenged sites,” said Davis, who added that there is a 20- to 25-foot buffer around the cap area to the border, where trees can be planted along the perimeter.